The big mover of Friday was in many ways the EUR/USD. 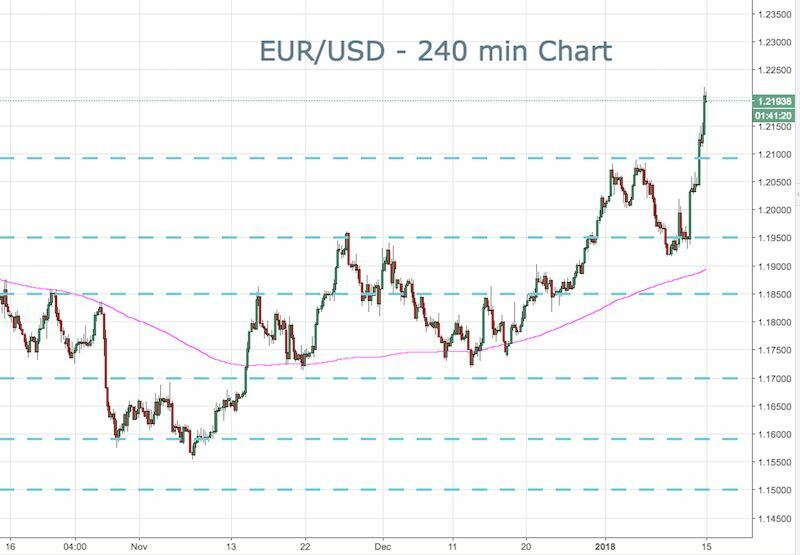 Prior to last week, 1.2100 had been providing really strong resistance and the Euro just didn’t seem like it was going to be able to crack through that level. However, as we saw a strong print for US CPI, the Greenback decided to plunge. It also coincided with the ECB minutes outlining just how QE appears to be winding down. I think we have to now saw that QE has been a failure. As it gets tapered and ultimately abandoned, money will start flowing back into the Eurozone. As such there is more upside potential for the EUR/USD. The next overhead level that I am watching is 125.00. This clearly isn’t a short-term trade, but rather one that is more fundamental in nature. The USD has been falling dramatically and the US Dollar Index (DXY) is taking out support levels. That’s putting more strength into the majors across the board. As QE ends in Europe then we will have even more money flowing into the Euro. The trade itself will likely be choppy so this is simply a directional idea for those out there trading the EUR/USD. This week we also have CPI data out of the Eurozone, which has the potential to give us another leg higher or push us back down to the 1.2100 level. I would suggest that any decent pullback on economic data might be a good opportunity to be a buyer of the EUR/USD for a longer-term move.